Verma, in her capacity as the Administrator of the Centers for Medicare and Medicaid Services, is the second highest ranking Indian-American in the Trump administration. 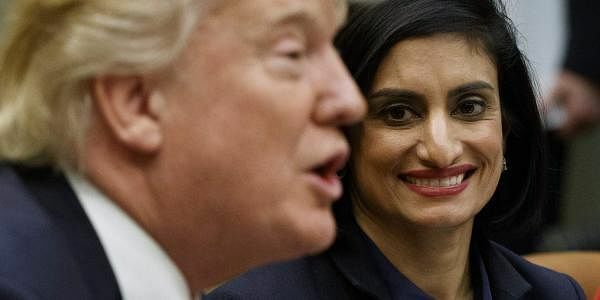 WASHINGTON: US President Donald Trump has praised Indian-American Seema Verma, head of a powerful federal health care agency, for doing a "wonderful" job in helping him repeal and replace the Obamacare. "Administrator Seema Verma is playing the leading role for us in helping us to repeal and replace Obamacare," Trump said in his brief remarks as he dropped by the Roosevelt Room of White House where Verma was hosting a listening session on Women in Health care panel. Verma, in her capacity as the Administrator of the Centers for Medicare and Medicaid Services, is the second highest ranking Indian-American in the Trump administration. Nikki Haley, who is the US Ambassador to the United Nations hold a cabinet rank position in the Trump administration. Verma held the listening session in the White House on the eve of a crucial vote in the House on repeal and replace of Obamacare. Trump described this as a big vote. "Big vote tomorrow in the House. I want to especially thank Seema the administrator of the Centers for Medicare and Medicaid Services (for) a wonderful job she's doing and definitely a complex job," said the US President. "But you have it under control, right?" Trump asked facing towards Verma who was sitting by his side. Trump thanked Verma for hosting the meeting to discuss the vital role of women playing in health care and the hardships inflicted on them by the Obamacare catastrophe. In his brief remarks, Verma thanked Trump for supporting her in her new role. "Obamacare has been a broken promise...instead of a meaningful health care, we have higher costs, less choices...," she said, adding that the problem is getting worse. Fortunately, she noted, there is now a government which is taking appropriate decisions in the best interest of people. "Obamacare is making it much harder for all of the doctors, nurses and health care professionals, men and women alike, to do their job," Trump said. "Millions of patients can no longer access the health care professionals they know and trust. Keep your doctor, keep your plan—it didn't work out that way, you don't get your doctor, you don't get your plan," he said. Trump said the doctors, nurses and health care professionals present at the panel discussion represent the millions of women, millions and millions, who play a vital and indispensable role in Americans' health care.